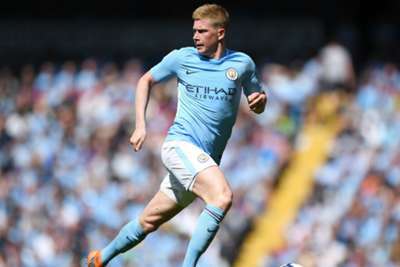 Manchester City manager Pep Guardiola believes Kevin De Bruyne's heavy workload for club and country over the past year may have been a contributing factor to his lateral knee ligament injury. City confirmed on Friday that De Bruyne is likely to be sidelined for around three months after sustaining the problem during training this week, even though surgery is not necessary. The 27-year-old midfielder was Guardiola's star performer on the way to Premier League and EFL Cup glory last term, making 52 appearances overall, before starting six matches as Belgium finished third at Russia 2018. City returned to action in the Community Shield against Chelsea three weeks on from the World Cup final and their manager feels such a quick turnaround does elite players such as De Bruyne no favours. "Last season Kevin was outstanding in all terms. For him and his family, these long injuries, you never want it. But you accept it as part of the game," he told a news conference ahead of Sunday's home match against Huddersfield Town. Pressed on whether a lack of rest was a cause of De Bruyne's setback, Guardiola - who lost Ilkay Gundogan and Benjamin Mendy to cruciate ligamanet damage in each of the past two seasons - responded: "We'll never know, I don't know exactly. Guardiola can at least be buoyed by Bernardo Silva's sparkling form in De Bruyne's customary playmaking role over the past two weeks, while namesake David Silva is back in training following a leg injury. As such, the former Barcelona and Bayern Munich boss is not looking beyond his squad for solutions – even after Claudio Marchisio became available on a free transfer following his release from Juventus. Asked whether he might be tempted to move for the 32-year-old Italy midfielder, Guardiola added: "No. First a big comment for his career - he made an amazing career at Juventus and with the national team.